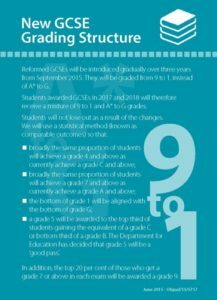 As you will be aware the government has introduced a new GCSE grading structure. GCSEs will now be measured against a 1-9 grading structure rather than the old A*-G model. The government has decided to take a phased approach to the implementation of these grades with GCSE English and mathematics being introduced in the summer of 2017. Most subjects are being introduced in the summer of 2018. However, there will be a few subjects who will not move to the new grades until 2019. What do the new numbers mean? Because the content in the new GCSEs is so different there is no simple and direct way to convert between the old GCSE A*-G grades and the new number grades. However, to ensure that the new system is fair to those students taking the new exams the government has fixed the percentages of students gaining particular grades against the old system. So for example the same proportion of students that gained an ‘A’ and above in the old GCSEs will now gain a grade 7 and above in the new GCSEs. However, this does not mean that a grade 7 is equal to an A grade as the content is so different. In the past GCSE grades were awarded to students when they demonstrated they had fulfilled certain criteria. For example, that they had mastered a particular skill recalled a particular piece of information. This allowed schools to make easy and relative accurate judgements about what grade a student was working at by simply checking off the criteria they had met. The new GCSE grading system is not linked to criteria. Instead students are awarded grades by their ranking nationally. This is a particular challenge to schools because we do not know how students are performing in other institutions and therefore cannot accurately assign grades to students. This is compounded by the fact that the new GCSEs have new content which makes any comparison with past measures very difficult. For the reasons outlined above the academy does not believe that GCSE grades should or can be used to assess students in KS3. We are therefore using an alternative approach to ensure that every student is ready to begin their GCSE with the requisite skills and knowledge and to enable parents to continue to monitor progress effectively. This system is being implemented by most schools across the UK and is designed to reflect the changes that the government has introduced into primary schools but also to provide a strong platform to prepare students for our raised expectations at GCSE. The academy will assess students’ progress against a set of minimum expected standards. These will be shared with students regularly and can also be found here on our website. A student meeting these standards will be on track to get a grade 5 or ‘strong pass’ at GCSE in that subject. As always departments will be regularly marking books, setting tests and extended tasks to track student progress. Students will receive regular feedback to ensure they know the next steps that they must take to progress. Any students identified as not meeting the expected standard will be offered further interventions such as study supports to ensure that they catch up. Grading in KS3 – Will my child be adequately challenged? In addition to targeting students who are below the ‘minimum expected standard’, departments will also be stretching students to move to ‘beyond’ it. In many instances this will not be about moving on to a new topic, instead students will be encouraged to deepen their knowledge further to ensure their conceptual understanding is thorough. This will provide the foundation students will need to ensure they are ready to start the new and more challenging GCSE programmes of study. Departments will share examples of how to move beyond the minimum expected standard with students and will provide extra work on TGi-Space for any students who wish to deepen their knowledge and understanding further at home.